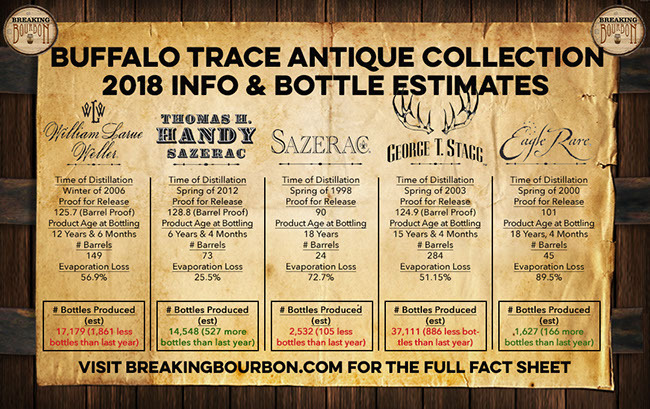 ‍FRANKFORT, FRANKLIN COUNTY, KY (Sept. 18, 2018) Fall is upon us, and that means Buffalo Trace Distillery is releasing its annual 2018 Antique Collection of whiskeys. 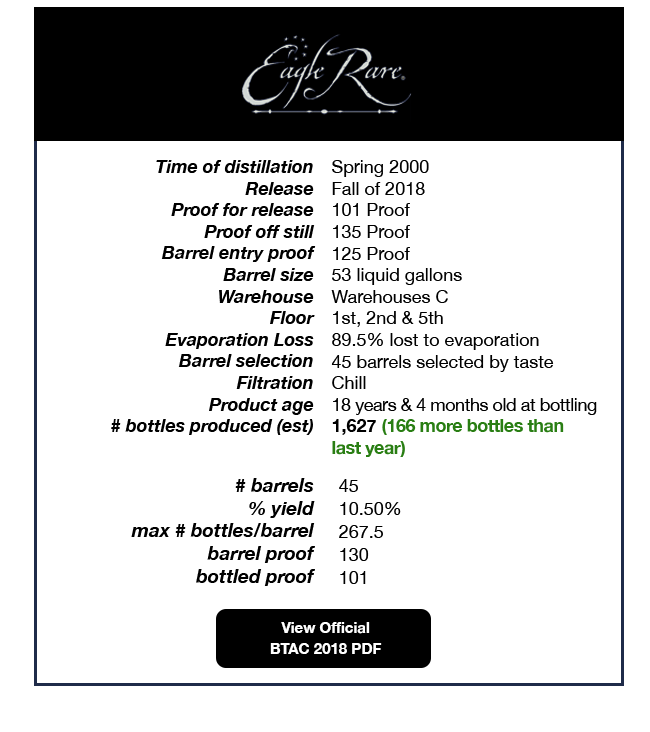 The highly anticipated collection will once again feature five limited-release whiskeys of various ages, recipes and proofs, with one notable change, Eagle Rare 17 Year Old Bourbon will now be 101 proof. Here’s what else fans can expect. ‍The powerhouse favorite of the Antique Collection, George T. Stagg weighs in at 124.9 proof this year. 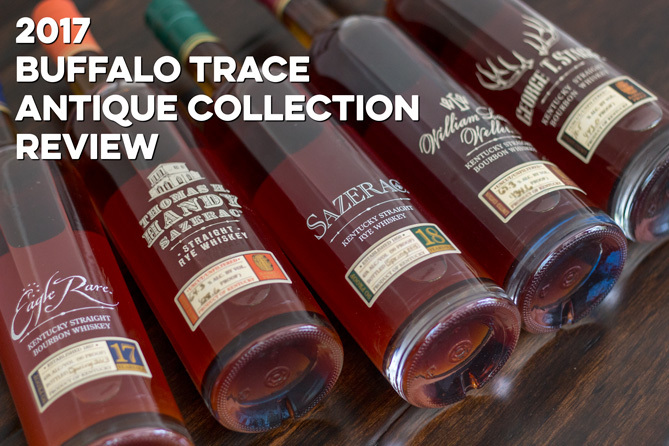 Past releases of this uncut and unfiltered bourbon have won many top awards, including last year’s release nabbing a Double Gold Medal at the 2018 San Francisco World Spirits Competition. This year’s release contains bourbon from barrels filled in the spring of 2003. This batch contained 284 barrels, not quite as much as last year’s yield, but still significantly more than the yield from previous years. Storage location of these barrels varied across warehouses C, H, I, K, P, and Q. This whiskey tastes of dark chocolate, espresso, and tobacco. 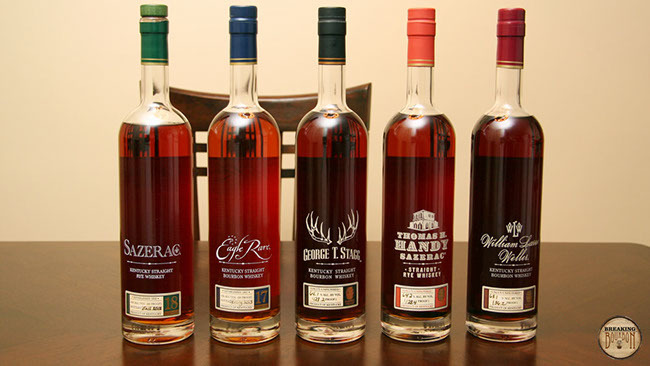 ‍The Antique Collection’s uncut, unfiltered, wheated recipe bourbon is William Larue Weller. Previous editions of this wheater have won many accolades, including a Double Gold Medal at the 2018 San Francisco World Spirits Competition and “Bourbon of the Year” by “Jim Murray’s Whisky Bible 2017.” The 2018 offering was distilled in the winter of 2006 and aged in Warehouses C, I, K, L, M, and Q. 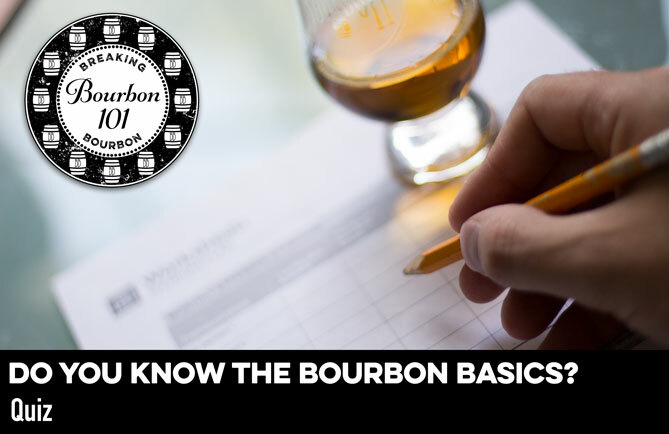 This bourbon registers in at 125.7 proof. The bold flavors include dried fruit, fig, and caramelized vanilla. ‍Thomas H. Handy is the uncut and unfiltered straight rye whiskey. “Jim Murray’s Whisky Bible 2018” named previous years’ releases “Best Rye Whiskey with no age statement.” This year’s Handy was distilled in the spring of 2012; aged in warehouses I and L and weighs in at 128.8 proof. The flavor profile includes hints of allspice, teaberry, and clove. ‍This year’s release is going back to its roots with a proof change from the previous 90 proof back to 101 proof, in tribute to the original strength used when the brand was launched in 1974. This will be a permanent change to the proof for the Eagle Rare 17 year old from this year forward. The 2018 edition was distilled in the Spring of 2000 and has been spending its time aging on the first, second and fifth floors of Warehouse C. This bourbon tastes of toasted oak, coffee, spearmint, and butterscotch. ‍Last year Sazerac Rye 18 Year Old was named “Best Rye Whiskey Aged 11 Years and Over” by “Jim Murray’s Whisky Bible 2018.” This 2018 straight rye whiskey release has notable flavors of dark chocolate, tobacco, and cinnamon. The barrels for this whiskey were filled in the spring of 1998. 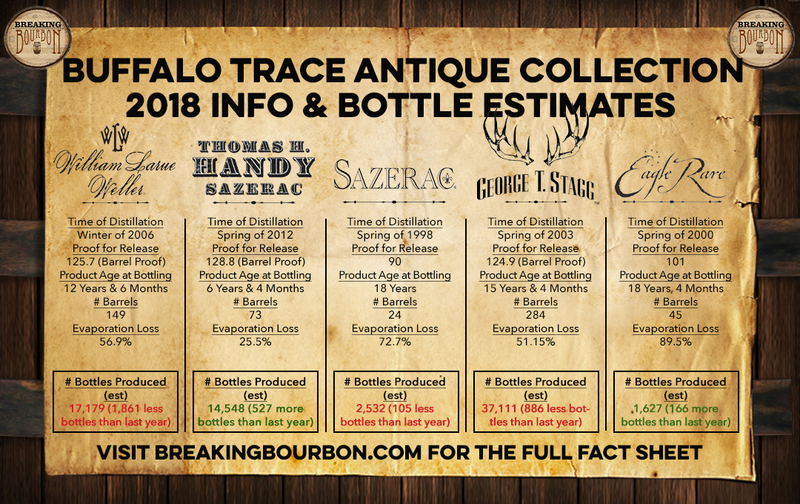 The 2018 Antique Collection whiskeys will be available in limited quantities starting in late September or early October. Suggested retail price is $99 each. 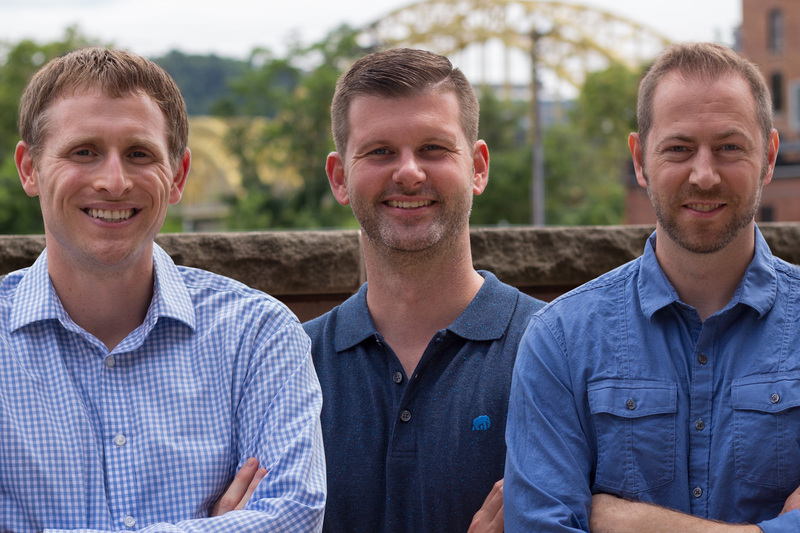 For more information visit the distillery's website.